Simple two button operation makes this high quality timer very easy to use! It's heavy duty, and perfect for use as an industrial production timer. Our CK-36 LED Count Up Desk Lab Timer provides accurate, reliable, and easy to read time keeping features. The CK-36 simply Counts UP, displaying elapsed time in Hours, Minutes, and Seconds. It has only two buttons for start-stop and reset to zero - very simple and easy to use! The CK-36 sits nicely on any desk or table, and is the perfect choice for many elapsed time clock applications. 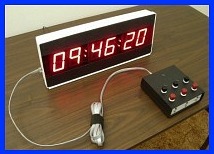 Highly readable six digit red LED display shows elapsed time in Hours, Minutes, and Seconds. Great for timing any event! LED Display Size: 0.56 inches - highly readable and sufficiently bright. No more squinting! Maximum Timing: Essentially 100 Hours with a maximum display of "99:59:59". Ultra Simple To Use! Two Button Operation: One button is for Start-Stop, and the other one is for Timer Reset back to 00:00:00. Straight Forward, Simple, & Easy to Use! CK-36R optional two button switch remote control is also available. Scroll down for more information. 60 Hertz AC line frequency time base provides excellent reliability and accuracy. RUGGED design and construction makes the CK-36 suitable for use as a commercial and industrial timer. 9 volt battery back up keeps time accurately during power interruptions. Never miss a second! 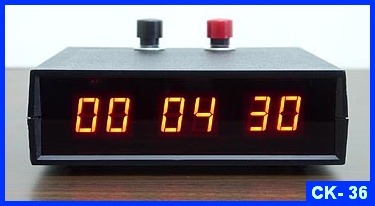 The CK-36 is a simple, free-running COUNT UP CLOCK. It is not settable to a certain time. It only indicates elapsed time. For a SETTABLE count up or count down timer, see our Model CK-3 Timer. Please scroll down this page for our list of timers. Each Button is Large, Rugged, and Reliable! The CK-36 Count Up Timer is available with an OPTIONAL Wired Remote Control! It plugs into a 1/4 inch jack on the back of the timer. This connection can also be used for external triggering and control of the timer. 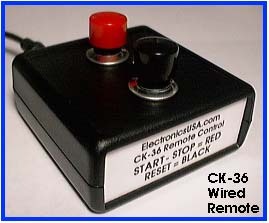 Order Model CK-36R Wired Remote Control. A 5 foot cable is included. A 25 foot extension cable is also available. Order Model MK-97 for $9.00. Five Year Warranty - Built to last! CK-46 Desk Industrial Stopwatch Timer : Count up stopwatch. CK-340 LED Industrial Digital Timer : Large 2.3 Inch LED display. CK-350 Large Count Up Timer : Large display version of the CK-36. It's also an elapsed time clock. CK-1 LED Desk Clock. 0.56 Inch LED display. Displays hours, minutes, and seconds. CK-1000 LED Large Digital Wall Clock: Large 2.3 Inch LED display. CK-2 LED Dual Time Zone Clock: 0.560 Inch dual LED display, six digits. CK-3 Digital Lab Timer: 0.56 Inch LED Display, Six Digits. CK-5000 Event Countdown Wall Clock: 1.75 inch Display shows DAYS, Hours, Minutes, & Seconds. CK-6 Day Countdown Clock: Count up or down desk timer with days.